The Delhi government has decided to file criminal cases against three television news channels on the basis of a magisterial probe which concluded they aired allegedly doctored videos of a controversial event at the Jawaharlal Nehru University involving its students’ union president Kanhaiya Kumar. Sources said the government’s legal team has been ordered to initiate action against the three channels whose names were not mentioned in the report by the New Delhi District Magistrate Sanjay Kumar. “Delhi government has directed its legal team to file a criminal case against three new channels which aired doctored videos on JNU student leader Kanhaiya Kumar,” said a senior government official. He said a lower court will be approached under Section 200 of CrPC under which a magistrate takes cognisance of an offence on receiving a complaint. Earlier on Monday, Communist Party of India-Marxist general secretary Sitaram Yechury and Janata Dal-United leader K C Tyagi met Chief Minister Arvind Kejriwal and demanded action against the TV channels which allegedly ran “doctored” videos on the JNU row. The magisterial probe, ordered by the Delhi government, had found that out of seven videos sent to a Hydrabad-based forensic lab, three were doctored, including one clipping of a news channel. As per report of the Hyderabad-based lab, two videos were “manipulated” where voices of persons not present in the clippings were added. In the manipulated clips, videos have been edited and voices have been added, the lab report had stated. The government’s probe did not find any evidence of JNU leader Kumar raising anti-India slogans at the controversial event in the university. Kanhaiya was charged with sedition following allegations that anti-national slogans were raised at the event to protest the hanging of Parliament attack convict Afzal Guru and Kashmiri separatist leader Maqbool Bhat. Kumar was released on bail last week, while two other JNU students Umar Khalid and Anirban Bhattacharya are lodged in Tihar jail in connection with the sedition case. 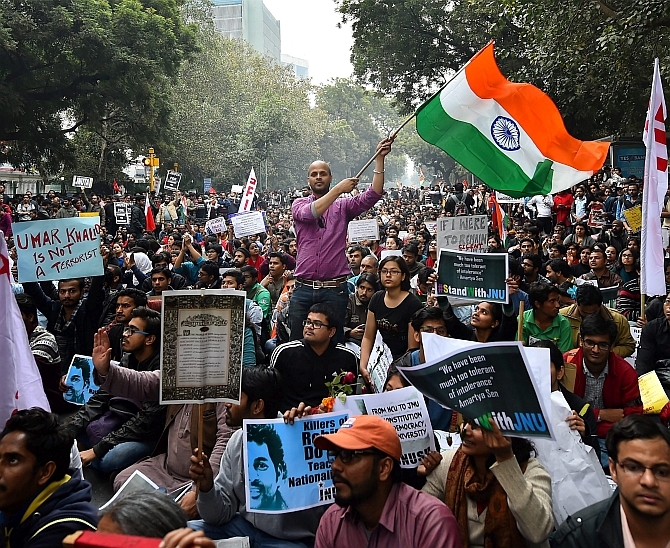 According to the probe report, anti-national slogans were chanted on the campus and JNU administration has already identified a “few faces” who were “clearly” heard raising them. The probe panel said their whereabouts must be found and their role investigated. Bleeding hearts! Don't bleed the nation!